That's a question that most of us assume people prefer not to ask or answer. It turns out, that's not the case. American attitudes toward aging are shifting, as attitudes tend to do over time. According to the findings of our national, Attitudes To Aging study, 65% of people surveyed across age ranges think they look good for their age, while 61% feel younger...despite the fact that on average, people have a biological age that is 3.13 years OLDER than their actual age! In the group of individuals who have tested their biological age using our own InnerAge product, a whopping 60% have an InnerAge that is older than what the calendar indicates. 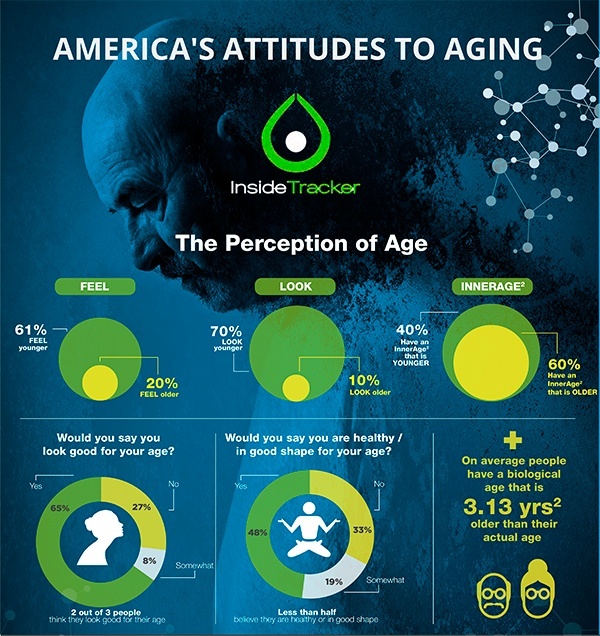 “While people claim to look and feel younger than their years, scientific study after study show people are in fact more likely to be older than their chronological age,” says Dr. Gil Blander, InsideTracker's founder and Chief Science Officer. That's the good news: peple are actively engaged in combating aging. And the study finds that a surprising 54% of them tend to choose dietary changes to address the effects of aging over less effective solutions like topical anti-aging creams. The better news: InsideTracker can help you take that a step further. 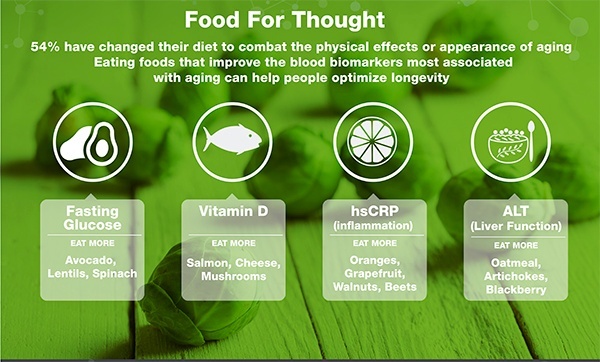 Go beyond just consuming the foods that are "good for us all"...we offer you a list of foods that are the best for YOU, based on your unique set of biomarkers, of course. Of course, you can't measure what you don't know. InsideTracker's InnerAge test will tell you just how hold you really are...and how to reclaim those years!